Long before he was known as the guy who played Gil Grissom, William Petersen portrayed Will Graham in the first film adaptation of the Thomas Harris novel Red Dragon. At the helm of this project was Michael Mann, the director who would later go on to such successes as Heat and The Last of the Mohicans. This was 1986, though. Anthony Hopkins was not the face of Hannibal Lecter at this time and I doubt that many people would be able to tell you who Hannibal Lecter even was in 1986. In fact, Lecter wasn't even Lector in this film. For whatever reasons Lecter's name was changed to "Lecktor." It possibly could have been a book rights thing, but I don't know. It's a silly change, no matter what. The actor to take up the reins of Lecktor was Brian Cox, a talented guy in his own right. He's only in this movie for a few minutes, but he does chew the scenery as a character as fascinating as his should. Anthony Hopkins definitely became Lecter for me with his performances, but Brian Cox deserves recognition for putting in a damn good performance and for being the first to play the crazy S.O.B. in a movie. Of course, Manhunter is not really about Lecktor at all. It's about Will Graham as he tries to find the sinister killer known as the Tooth Fairy. William Petersen is excellent as Graham. I don't really feel like going into whether or not Petersen's Graham is better than Edward Norton's, but if anyone ever says that Petersen is just famous because of his CSI stuff then I'd say some homework should be in order. Start with this movie. As for the man that this movie is all about, Francis Dolarhyde is brought to life in the form of Tom Noonan. Even though he doesn't even appear until the final hour of the movie he quickly becomes the primary focus. Yeah, he's the main bad guy of the movie, but it's his fight against his inner dragon that is so fascinating. The book does a much better job of covering this territory, but Tom Noonan does manage to convey a bit of what's missing. It's a masterful job. I think I still prefer Ralph Fiennes's performance in the remake, but not by much. Of course, this movie is dominated even more so by Michael Mann's stylistic touches. That's the true star of the film. While sometimes things do go a bit overboard (I thought the all-white jail cell was a bit much), I did appreciate the use of colors and sounds to convey the mood and atmosphere for the most part. It's pretty obvious to see that this wasn't a movie made just for the hell of it. Since this is the 80's, there's also a stifling synth-filled soundtrack that sometimes feels like John Carpenter and at other times feels like someone syphoned all of the rejected songs from the soundtrack of Brian De Palma's Scarface. I kept waiting for Drive by The Cars to start playing at some point. It would have been a great addition to the ending credits. The synths just come with the territory with this flick and you'll either manage to get around that or not. One thing I noticed about this movie was how much of Dolarhyde's backstory was left out compared to the novel. The other obvious thing was that Manhunter left out the final act of the novel entirely. At least the 2002 remake got that part right. All in all, Manhunter is an excellent film. Dated, certainly, but still an excellent film. It was a product of its time, but it has enough talent involved with it that warrants the still fairly newfound appreciation directed toward this "cult" movie. 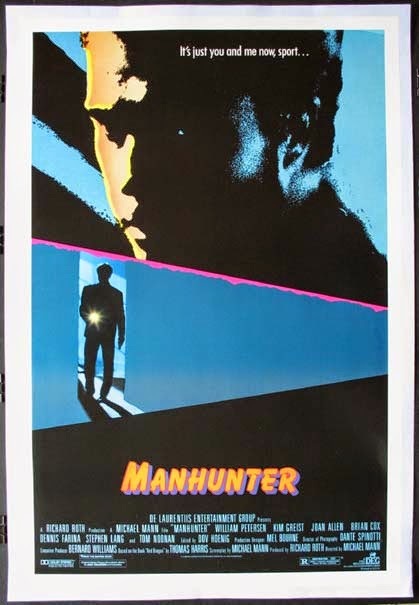 Obviously, Petersen's role in CSI and all of the subsequent Hannibal Lecter projects helped boost the reputation of this movie (as well as the original novel which is excellent in its own right), but even if you don't care about any of that other stuff you should still watch Manhunter at least once. Between this film and its remake, I couldn't really choose because they are both well-made and worth seeing. This one is definitely more artsy, though. It's all a matter of taste, really.